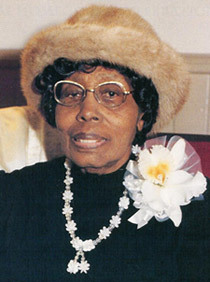 First Lady to the McGlothen Temple Church of God in Christ for 23 years, from 1941 - 1964. I will say to the Lord, He is my refuge and my fortress: my God; in Him will I trust. Mother McGlothen was a faithful servant to her Lord and church. In 1924, Mother McGlothen acknowledged her call to ministry. She united in ministry with her husband as he served as pastor of churches in Tulsa, Hugo and Idabelle, Oklahoma; Des Moines, Iowa; Fresno, Los Angeles, and Richmond, California. In 1933, she was appointed California State Supervisor and installed in April 1934. She was given the Northern area while Mother Hale was Supervisor in the Southern area under the leadership of Bishop S.M. Crouch. On December 13, 1939, Mother Lizzie Roberson appointed Mother McGlothen State Supervisor for the States of California and Washington. From 1944 to November 1957, she served as Supervisor of all of Northern California under the Bishop E.B. Stewart. In November 1957, Bishop E.E. Hamilton came to Northern California and began a work with twenty-two churches that grew to sixty-three churches by the time the Jurisdiction was officially organized in January 1958. Mother McGlothen was then appointed Supervisor of California Northwest Jurisdiction where she has served faithfully for over thirty six years with five Jurisdictional Prelates: Bishops E.E. Hamilton, Sr. Martin, Milton Mathis, Clarence James Davis and W. Wyatt Hamilton. In addition to her duties as jurisdictional supervisor, Dr. McGlothen served the International Women’s Department as President of Hospitality for over 28 years and Assistant General Supervisor to Mother Annie Bailey. In 1976, she was appointed General Supervisor of the International Department of Women by the late Bishop J.O. Patterson, Sr., Presiding Bishop of the Church of God in Christ. She also served with the late Bishop L.H. Ford since the inception of his administration as Presiding Prelate of the Church of God in Christ. Under the prolific leadership of Dr. Mattie McGlothen, the International Women’s Department had phenomenal growth. She either organized or reorganized the International Hospitality, the Education and Scholarship Fund, the Bishop’s Wives Scholarship Fund, the Screening Committee for the Jurisdictional Supervisors, the McGlothen Foundation, the Emergency Relief fund, the WE 12, the Lavender Ladies, the Leadership Conference for Jurisdictional Supervisors and National Workers, the California Northwest First Thursday (now First Saturday) Union meetings, and the Business and Professional Women’s Federation. Through her initiative and with the assistance of the International Women’s Department in 1938, a home was built for missionaries in the Bahama Islands; the guest house on the Lexington School Campus was furnished; in 1984, a pavilion was built in Port-au-Prince, Haiti for senior citizens and unwed mothers; from 1985 through 1991, three homes were purchased in Memphis, Tennessee which now comprise the McGlothen Complex and houses the administrative offices of the International Women’s Department. The Women’s International Convention under her supervision garnered the distinction of being the second largest convention held in the Church of god in Christ, and is noted and distinguished throughout the United States for its organization and positive influence. Since 1989, the Women’s International Convention has, from its proceeds, contributed to the underprivileged and community projects in each convention city. The magnitude of this great woman of God can be seen in the numerous awards, citations, and recognitions she received. Among those are honorary degrees of Doctors of Laws and Divinity; recognition by Mars Press in the Biographical Dictionary of African American Holiness-Pentecostals; the Dr. Mattie McGlothen Library/Museum, Richmond, California; the Mother Mattie McGlothen Home of Love and Hope Emergency Shelter, Memphis, Tennessee; and Dr. Mattie McGlothen Senior Housing, Oakland, California. She also has been honored by the state legislatures of California, Michigan, Virginia, Wisconsin, and Tennessee and has received the keys and honorary citizenship to many cities throughout the United States. She was been cited by the Charles Harrison Mason System of Bible Colleges, the Charles Harrison mason Theological Seminary, the Religious Workers guild, Bishop J.O. Patterson, Sr. and many other church organizations for outstanding, dedicated and loyal service to the Church of God in Christ. Mother McGlothen was honored in Contra Costa County, California as “Woman builder of the Year”, May 1988 and was a member of the Parole Board of Contra Costa County for many years. Mother McGlothen was called from labor to reward on May 4, 1994.